Bradford Literature Festival, in association with Provident Financial Group, (BLF) is an international festival based in Bradford, which has grown from an audience of 968 attendees in 2014, to over 50,000 attendees in 2017. Hailed as one of the most inspirational festivals in the UK, BLF is a key event in the UK's cultural calendar. Over 500 speakers in more than 400 sessions, feature in the fourth edition of Bradford Literature Festival, in association with Provident Financial Group, taking place from 29 June to 8 July 2018. As a ‘young’ festival, BLF is freed from the shackles of ‘traditional’ festival programming - offering a unique opportunity to celebrate the written and spoken word in all forms, and showcase the intimate relationship between words and other art forms such as theatre, music and film. Newly published books launching at Bradford Literature Festival 2018 include: Why I am A Hindu by Shashi Tharoor; The Business Plan for Peace by Dr Scilla Elworthy; Don’t Let My Past be Your Future by Harry Leslie Smith; My Mother is Not Your Mother by Margaret Hockney, and City of Sinners by Bradford’s own A. A. Dhand. Other participants in this year’s programme include: Kashmiri Nobel Peace Prize nominee Parveena Ahanger, David Starkey, Jeanette Winterson, Robin Ince, Elif Shafak, Ben Okri, Suzi Quatro, Akala, Frank Bruno, Nimco Ali, Dennis Skinner, David Starkey, Terry Deary, Kei Miller and Joanna Hoffman. 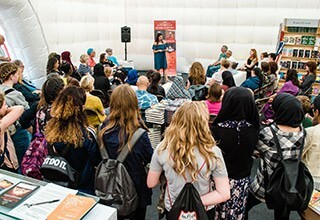 In a new landmark literary partnership, Bradford Literature Festival will be joining forces with Hay Festival, to launch a new pupil exchange programme, alongside a series of events specially curated by Bradford Literature Festival for Hay Festival 2018. The new student exchange programme will see 10 Year 9 pupils from Bradford attend Hay Festival for two nights this May, while 10 Year 9 pupils from Powys and Herefordshire will attend Bradford Literature Festival in June. The exchange aims to expand and enrich both groups’ life experiences, encouraging engagement and empathy, and using culture as a powerful transformational tool. BLF’s events at Hay will include a selection of specially commissioned film poems responding to the paintings of Gustav Klimt on the 100th anniversary of his death. Other partners for this year’s festival include National Youth Theatre, Outspoken, Speaking Volumes and the Bronte Parsonage Museum. and manage their own session to feature on the official festival programme. The young curators are responsible for all aspects of the event, from identifying and inviting speakers, to marketing and logistics. The festival’s schools programme, which will reach upwards of 15,000 students this year, will welcome authors such as Terry Deary, creator of the Horrible Histories series, and Johnny Duddle, winner of the Waterstones Children’s Book Prize. The diverse thematic sessions in this year’s programme range from scientific explorations of gene therapy in the context of Mary Shelley’s Frankenstein, to conversations between leading crime fiction writers. Major political anniversaries will be remembered as the festival marks the centenary of the start of women’s suffrage in Britain, and of the First World War’s Armistice; 50 years since the assassination of Martin Luther King; 20 years since the Stephen Lawrence enquiry; and Nelson Mandela’s 100th birthday. Discussions about the state of Jerusalem today, sit alongside debates around the idea of ‘stateless’ nations such as Kashmir, Tibet, Kurdistan and Palestine. The festival partners with Speaking Volumes to mark the anniversary, and explore the legacy, of Empire Windrush through discussion, music and performance rooted in Caribbean culture. This year’s programme also features two tandem events that will explore some of the key influences of Bradford-born artist David Hockney. The first will examine the poetry that has inspired David Hockney throughout his career, in a unique event taking place at Bradford Cartwright Hall’s Hockney Gallery. The second event, will see the launch of Margaret Hockney’s compelling memoir My Mother is Not Your Mother, which unpicks the home life of the Hockney family, Margaret’s experience growing up with three brothers (including the enigmatic David), and her troubled relationship with their mother. As always, poetry is a fundamental part of Bradford Literature Festival. 1970s American rock star Suzi Quatro launches ‘Songbook’, a new annual event for BLF, which celebrates the lyrics and influences of a major songwriter. Poetic responses to the First World War’s Armistice will be heard at an event presented in partnership with Hay Festival and the United Nations, and Festival favourites like Poetry with a Punch, Sacred Poetry and Lyrical Mehfil also return for another year. Confirmed poets include Ben Okri, Kei Miller, Vahni Capildeo and Joanna Hoffman. Discussions on world affairs and politics this year include Bradford’s involvement in the campaign for nuclear disarmament, the media’s role in fuelling Islamophobia, Europe’s love affair with the far-right and a satirical exploration of Jeremy Corbyn’s superhero persona in The Corbyn Comic Book. The festival has attracted politicians and activists such as Dennis Skinner, Nimco Ali and Parveena Ahanger. along an atmospheric route between the Brontë birthplace in Thornton, and their family Parsonage at Haworth. Other returning regular strands Mysticism and Philosophy, Future Living, and Ethics & Faith will provide a vast array of events on topics ranging from the dystopic nature of the digital space to Rumi on the mystery of being human, from the intersection between climate change and race to the realities of a robopocalypse. View the full Bradford Literature Festival 2018 programme at bradfordlitfest.co.uk. Booking is open now online or via 01274 238374. The festival was set up as a response to the challenges society faces, on a local and global level. At a time when imagination and empathy are crucial tools for tackling the big issues of our time, there are many who would prefer a narrower vision of life, in which increasingly smaller boxes divide and define us. The festival seeks to break down these artificial barriers, by creating a space where ideas and stories can lead to mutual understanding, reminding us that it is our shared humanity that is the common denominator. Writers and poets have always been our conscience – standing at the edge of society and providing the vision and clarity necessary for critical self-evaluation and growth. This year’s programme exemplifies the festival ethos of reflecting society as a whole, giving a platform to artists from an extraordinary range of backgrounds, nations, cultures, and perspectives. The Festival is especially proud to bring to the fore marginalised voices who offer audiences the opportunity to understand our world in new, and unexpected, ways.